Under simultaneous and opposing pressures from the Allies and the Soviets, Germany was divided. The Berlin Wall separated West and East Berlin, the latter being under the control of the Soviets. 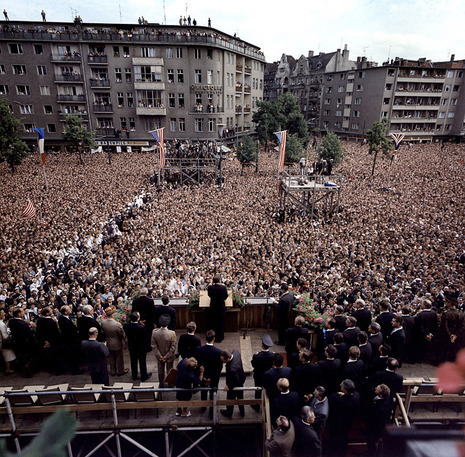 On June 26, 1963, Kennedy visited West Berlin and gave a public speech criticizing communism. 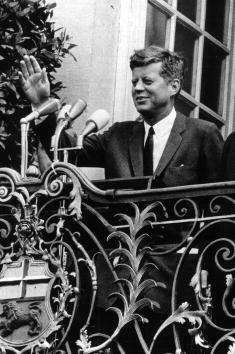 Kennedy used the construction of the Berlin Wall as an example of the failures of communism: "Freedom has many difficulties and democracy is not perfect, but we have never had to put a wall up to keep our people in." The speech is known for its famous phrase "Ich bin ein Berliner". 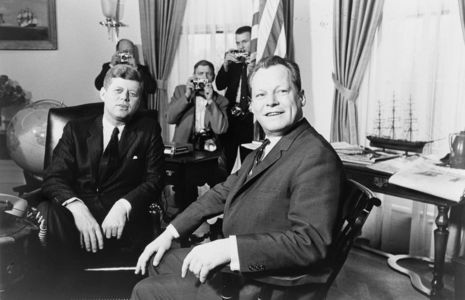 Nearly five-sixths of the population was on the street when Kennedy said the famous phrase. He remarked to aides afterwards: "We'll never have another day like this one." His first stop was Germany, a nation that less than 20 years before had been engaged in a quest for world conquest under the dictatorship of Hitler. Following Germany's defeat in the Second World War, the country had been divided in half, with East Germany under Soviet control and West Germany becoming a democratic nation. East-West Germany soon became the focus of growing political tensions between the two new superpowers, the United States and the Soviet Union. Berlin, former capital of Hitler's Reich, became the political hot spot in this new 'cold' war. Although the city was located in East Germany, Berlin itself was divided, with East Berlin under Soviet control and West Berlin under American, English and French jurisdiction.